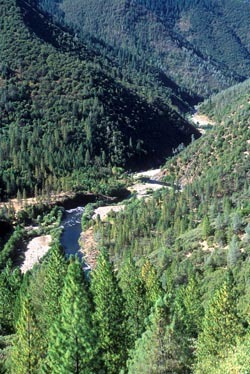 The most famous feature of the Middle Fork of the American River is rooted in the California Gold Rush. In the mid 19th century, miners diverted the river at Horseshoe Bend, a stretch of river particularly rich in gold and blasted a hole through solid rock in order to re-route the water and get the gold. The result is the infamous Tunnel Chute rapid that ends by flowing through a 90 foot rock tunnel. Other rapids include Kanaka, Cleavage, and Catapult. At mile 14, Ruck-a-Chucky is mired in myth and controversy. A 30 foot waterfall long considered unrunnable at worst and risky at best, Ruck-a-Chucky has started to be run by extreme boaters; commercial guests, however, continue to walk around or “portage” the rapid. The Middle Fork American canyon is beautiful and striking. There are very few homes and no commercial development along the raftable section but you might see a fisherman or miner or two (there are still some small commercial dredges operating successfully in the canyon, which are certainly not lovely, but are an unmistakable reminder of the important history of this river and the surrounding area). Steep canyon walls are thick with trees and signs of wildlife–now and then people even see bears among the trees. Boaters with plenty of time to spare can also do side hikes to check out beautiful waterfalls and swimming holes.